If the USMC wants to improve the decision-making, adaptability and other core warfighting skills, then we must change the way Marines learn from the current approach (which is internal process-focused, primarily based on the “Competency theory”) to a new approach (which is externally, effect/outcome-focused) more aligned with the outcomes we are seeking (see Figure 1 below). This figure was created by the recent students from the Tactics Instruction Section at USMC Officer Candidate School or OCS. They compared what they currently do with learning (referred to as training) and what they learned during the week of 5-9 November 2018. To the left as you view the chart is the current approach to learning, born out of the competency theory of education adapted by all public schools in 1905. It was employed by the U.S. Military for World War I, and institutionalized after WWII. To the right is what the USMC OCS cadre learned over five days referred to as Outcomes Based Learning or OBL. They compared the latter to the doctrine referred to as Mission Tactics or Mission Command in MCDP-1 Warfighting. These points will be discussed further throughout the paper. Figure 1: From Old to New. In addition to establishing the “current situation” as one wherein Marines have been largely successful; there remains a continuous struggle to evolve both their warfighting and learning approaches (which are interconnected). Essentially, the Marines (and the military at-large) are overcoming their learning model. We are succeeding despite, rather than because of the current model. Considering the changing face of war and the increased requirement for MAGTFs to prepare for Full Spectrum Operations, a Learning philosophy seeks to merge the benefits of training and education with self-learning and experience. The Learning philosophy helps create thinking Marines and MAGTFs that can solve problems under stress based on an understanding of the problem. A well tried and proven Learning Philosophy the Marine could evolve to is called Outcomes Based Training and Education (OBT&E), now called Outcomes-Based Learning (OBL). The doctrine of OBL stresses the development of intangible attributes such as initiative, critical thinking, judgement, and responsibility. The Learning philosophy uses observable outcomes to measure the self-development and effectiveness of Learning. More importantly, it uses those outcomes to develop more adaptive Marines and MAGTFs who are better prepared for the rigors of 21st Century combat. 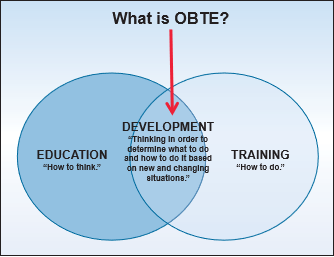 What is OBT&E or OBL (Outcomes Based Learning)? Outcomes-based Learning (OBL) is a different system for development, meaning both training and education are nested under Learning. By the way of analogy, OBL is to Learning what Mission Command or Mission Orders is to operations. Instructors are given requirements but not directed how they must achieve them. They are then held accountable for the results. OBTE/OBL is not a POI, a workshop, etc. Rather it is an approach to Learning that can (and should) be used in EVERY school, POI, etc. It needs to be clear (at the conceptual level anyway) that OBTE/OBL is the “Information Age” approach that is the best way of getting to what Major General William Mullen, commanding general of Training and Education Command (TECOM) defined as the “intellectual edge” in his 18 July 2018 guidance on the direction Marine Learning should evolve. Current USMC training methods seek to teach Marines and their leaders how to apply pre-defined, approved process” (which in the case of a T&R event must, by rule, be performed exactly to the checklist to be “correct”). Nominally these processes “flow down” from doctrine, but are not considered doctrine by CD&I. Doctrine isn’t the issue. It’s the “textual adherence” to process without regard to context that’s the issue. OBL seeks instead to teach them how to frame problems and solve them, focusing on the results rather than the methods used to obtain them. Methods are useful “tools” to guide/assist; they just shouldn’t have the firmness of the earth if we have a better way, which OBL provides. It is thus designed to create thinking, adaptive Marines and leaders who can apply what they know to solve problems they have not previously encountered. Figure 2: What is OBT&E now OBL? OBL is an approach to planning, managing, and delivering Learning. It results in the attainment of a set of holistic, observable, and measurable skills and behavioral traits (outcomes) in individuals and units. It does so by requiring a thorough understanding of the underlying principles and increasing mastery of fundamentals, gained while progressing through a series of increasingly challenging scenarios. These scenarios always require the instructor and student to think and solve problems in context; tasks are taught in context of a problem, and not in standalone step processes used today. Col. John Boyd identified the three important determinants of success People, Ideas and Things – in that order. Identifying and developing good leaders and followers is the first obligation of any large organization – without those leaders the best ideas will not emerge and cannot succeed and without devoted followers, the vision and decision of leaders will not be realized. Organizations are already full of potentially brilliant leaders and entrepreneurs who just need to be unleashed on the problems and opportunities a competitive economy presents. The Mission Command/OBL workshop imparts the concepts and skill set necessary to become an adaptive organization operating under a culture of Maneuver Warfare (in MCDP Warfighting it is referred to “Mission-Orders” or Mission-Command”) – balancing the harmonized effort of the traditionally centralized structures of a large organization like the USMC with the individual leadership, initiative and creativity found in smaller organizations or the start-up culture. More than just empowering leaders within your organization to seize opportunities and react to threats as they emerge, they must be prepared the right way to take charge and make decisions with little guidance from above (see Figure 3 below). Complexity in development requires less control from above, not more. For example, we recently conducted the Five-day Mission Command and OBL workshop for the USMC Officer Candidate School (OCS) Tactics Section (5-7 NOV 18). This was an exciting first step on the road to creating a fast moving, adaptive organization with dynamic and courageous leadership. It focuses on “training the trainers” exposing them to several teaching tools. We used proven Outcomes Based Learning and Adaptive Learning methodologies to ensure participants stayed fully engaged and involved throughout the five-day session. The workshop employed interactive Tactical Decision Games (TDGs) (or as USMA DMI calls them Tactical Decision Exercises or TDEs), wargaming (using both map and dry erase versions of Kriegespiels (wargames)), peer assessment and lively analytical discussions creating a safe yet challenging environment for all participants. We also exposed the USMC OCS cadre to how to create Outcomes and Measures of Effectiveness, as well as planning and executing Free Play Force on Force Exercises, and the Tactical Decision Game Physical Training (the students planned and conducted both exercises followed by a student led detailed and well facilitated AAR). Quickly developed a sense of trust among their team as they explore complex problems and build dynamic, adaptive teams. Got exposed to a variety of tools from TDGs to wargaming, and free play force on force exercises to use to develop adaptability and prepare students or subordinates how to succeed in a culture of Mission Command. Understood how to develop Strength of Character as the premise of each and every course through problem solving scenarios, facilitation and ownership of learning, and finally through effective AARs. How to teach without PowerPoints and no lectures. Theories of learning and decision making are only introduced if asked by the students or to support a given tool or methodology. During the workshop we introduced and practiced After Action Reviews (AAR), a tool adapted from the U.S. Marine Corps and Army, and a vital building block for developing adaptive leaders and teams. The trust, respect and understanding developed within the workshop enables students to honestly, effectively and critically evaluate themselves and their peers, critiquing the decisions not the decision-makers. Conducting effective AARs is also a great way of promoting an adaptive culture, helping disseminate knowledge, experience and hard-won lessons throughout the organization and encouraging the faster and more effective decision making and action. Most learning occurs during these sessions. The Mission Command/OBL workshop deliberately introduces mild stressors into decision-making games, looking to raise the heart-rate of participants into the optimal zone between 115-145bpm. This occurs from the very start (no introduction, it jumps right into a problem-solving game) as soon as the students arrive. While initially participants might spike above those levels, it is precisely this kind of safe, repeatable practice that will allow them to calmly and confidently confront future real-world challenges. The workshop approach to teaching with TDGs/TDEs uses OBL Learning doctrine, proven to embed and imprint experiences in adult learners. Important to note that OBL is in action inside formal schools as well as the operating force – formal and informal learning environments. It proved highly successful in the formal school setting at the United States Military Academy’s (West Point) Department of Military Instruction (DMI) as it evolved from the Industrial-Age to Information-Age in 2008 to 2012 under the leadership of Colonel Casey Haskins. Another course where OBL has been highly successful is at the US Army’s Reconnaissance Course (ARC) at Fort Benning, GA. It was also introduced in 2009 and 2010 at the USMC Expeditionary Warfare School (EWS), and at the USMC Infantry Officer Couse (IOC) in 2010 and 2011. It was also introduced to the USMC The Basic School or TBS in the summer of 2012. It also worked exceptionally well for the OPFOR as the U.S. Army’s 4-10 Cavalry Squadron moved from the linear way of training and education to OBL in 2014-2016 under the leadership of Lieutenant Colonel Chad R Foster. Under the Formal School and OPFOR examples, OBL relied heavily on the instructors growing expertise and ability and much less on scripts, standard procedures, or external controls. It standardized Learning by the results or outcomes. In other words, success was judged when the student or unit demonstrated they can solve a new problem to an acceptable level using their newly developed skills and or knowledge. 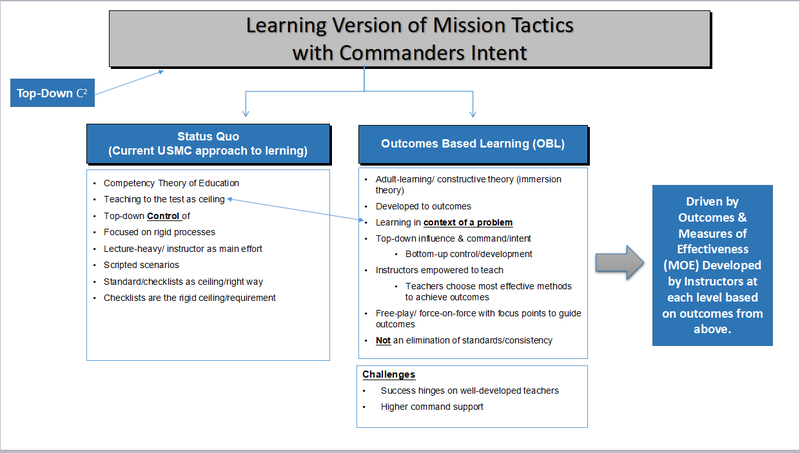 OBL does not standardize learning by the process (every student will first do A, then do B, then advance to C, and finally qualify on D) or by inputs/throughputs (each student will fire three rounds, spend 2.5 hours on this topic, watch these slides, do three iterations of this drill, or we got 1000 Marines through the training, etc.). It recognizes that many skills and situations have more than one acceptable way of solving the problem and does not mandate one solution. Nor does it specify one way to teach a particular skill or to learn it (see figure 3). As is currently believed, processed oriented task training, regardless of the task, is not fundamental to learning. Critical thinking and problem solving is the first thing that young or new people should be immersed in, growing in complexity as they move along their career continuum. OBL explicitly focuses at every step on developing such “intangible” traits as critical thinking, judgment, problem solving, initiative and accountability—in both the instructors and the students. Though there are similarities, Outcomes-Based Learning are not just new words for old concepts. Outcomes are not merely terminal learning objectives. Measures of Effectiveness (MoEs) are not merely task standards. Many senior leaders, upon hearing of OBL, claim they’ve always done it. This is a common misperception. The vast majority have not. Finally, OBL requires no more resources than the standard USMC Training and Readiness or the T&R training model. While it will require a new method for allotting resources, since inputs (number of rounds, hours, miles, etc…) no longer drive the development, a standard package of resources will still suffice, so long as the instructors have been developed so they understand how to use them employing an array of various learning tools. The first, and arguably the most important, step at every level from the Marine Corps HQ down to the lowest level of command, directorate or section in a course, is developing an outcome. Outcomes, like Commander’s intents, should flow from top to bottom with some overlap, but not much. 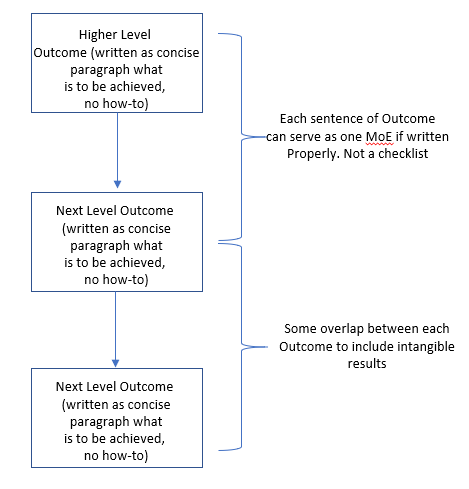 An outcome clearly defines what success is desired at the end of the development event, being a class, phase in a course, or the course itself, flowing down from a given command and higher (See Figure 4). The outcomes should be simply stated in clear language. Ideally, they are broad, rather than detailed, and holistic. In other words, they are not meant to stand alone, but together. That is important because it prevents a leader from conducting training that might further one outcome while hindering or even going backward in others. In the case of a unit, the outcomes are a statement of what the unit should be able to do, and they should describe its values and behavior. In the case of a school, they specify what each graduate should be and able to do, upon completion of a given phase, course or the entire school. Each outcome is then expanded one level into “measures of effectiveness” (MoE). These MoEs answer the question, “what does success in this outcome look like?” Taken together, the MoEs define success. Furthermore, each MoE should be measurable or at least observable, so that they form not just the basis for the training program, but also the basis for the assessment. OBL is most like standard training in this step. However, there are two main differences. As with the current way the training plan is developed, the OBL Development plan is not the point around which everything hinges; the outcomes are. So, if something isn’t working, the plan changes (without going through massive layers of approval to change it). Traditionally, units have tended to do this well, but schools/courses are much more rigid (as we discovered in the Mission Command/OBL workshop with USMC OCS). Using OBL, the Program of Instruction (PoI) in a school will change from one cycle to the next as leaders/instructors/cadre assess successes or failure at achieving outcomes. The other and more significant way in which OBL differs from standard USMC training plans is that instructors receive more latitude. Less is directed by higher headquarters, but the plan correspondingly builds in accountability. For instance, if land navigation is part of a school, the plan might build in several days with little direction, available to junior leaders, and resourced with training areas and transportation. There would be no expectation that each leader would use the time the same way. A description of the types of navigation problems each student would be expected to solve on the final day should provide sufficient guidance for developed leaders to teach their Marines; those Marines performance will then show clearly how well each leader did and allow the change of command to hold leaders accountable. The endstate that the Marines are seeking is the conduct of OBL is adaptable Marines that can operate more effectively under a doctrine of Maneuver Warfare. OBL aligns well with the principles of Maneuver Warfare, particularly Mission Command or Mission Orders. What does it provide if executed as per the proposed Learning Philosophy? This is a significant area where it will differ from today’s Marine Corps training. The differences stem mostly from an attempt to make training better fit human nature, rather than working against it as Marine Corps learning often has today. OBL is also geared to fit better with the ambiguity and complexity of today’s and future warfare. According to Dr. Alana Niscastro, educator at USMC Marine Corps Training and Operations Group, And is aligned with our motto – improvise, adapt and overcome. It also helps establish” a culture of learning” and this “intellectual edge” yearning. Ha! Talk about institutional message alignment! Our current rigid practices take us farther away from realizing our brilliancy. Learning is a platform for experimentation. The cadre from USMC OCS found out there is far more flexibility granted to both teachers and Marines, with far fewer external controls. This requires an investment in developing leaders (both on the skills and on how to teach). An overwhelming majority of both leaders and Marines respond and perform at a much higher level. The OCS cadre on Day 5, the final day said they wanted more to become proficient! OBL emphasizes principles rather than checklists, procedures, or standards. While there are certainly minimum standards outlined in T & R manuals for what an acceptable performance is, they are rarely discussed with the Marines. The Marines then strive to do their best. OBL emphasizes the “Why”. Traditional Marine Corps training emphasizes the “what” and “how” but too often neglects the “why”. For instance, every Marine knows how to low crawl, but surprisingly few can explain when it might make sense to do so. They therefore avoid doing it at all or they tend to do it inappropriate circumstances. Learning philosophy builds in the “why” from the beginning and reinforces it at every step requiring the student to solve problems and newly acquired knowledge and skills. As Marines solve problems, and learn by doing, they are required to figure as much of it out for themselves as they are capable of. This “guided-self-discovery”, in which the leader or teacher guides or facilitates the Marine only through the bits of a problem that they can’t figure out for themselves, helps the Marine move thoroughly understand the concepts and to connect them to their context. While it may take a bit longer to learn, the learning is deeper and retained longer. Marines in the new Learning philosophy are conditioned from the beginning to think to solve problems. In much of traditional Marine training, by contrast, Marines are told what to do, whether or not they understand why. They are therefore being conditioned not to think and not to solve problems, but rather to follow sequences and procedures. This conditioning causes them difficulty when they are forced to adapt to new and unexpected circumstances. Not only are they less experienced at solving problems, but they are conditioned not to try (See Figure 6 below). Problems expressed through scenarios employing an array of various delivery tools under the OBL are realistic and don’t divorce the skill from its context. To take an example, treating a casualty in combat is different than treating one in a classroom or on a range. This situation changes the medical response. For instance, the need to move the casualty to a less vulnerable location for further treatment not only changes the sequence of treatment steps in controlling the bleeding (a tourniquet is immediate rather than after trying direct pressure and elevation) but also requires the Marine to balance medical treatment with security, control of the unit, and accounting for personnel. Together, this results in a fundamentally different learning experience from traditional training that isolates each task and trains them one at a time. Stress is reversed. Normally in a Marine Corps school or course, the Marine will experience a high level of stress at the beginning. Whether induced intentionally or inadvertently through the unfamiliarity of the situation, that stress usually interferes in mastering the fundamentals. The Marine is more focused on avoiding trouble than in mastering the skills. OBL, in contrast, begins all learning with little or no stress. Treating the Marines as adults, teachers explain skills thoroughly, breaking them down into their fundamentals, making sure Marines understand principles and the “why” behind each skill, but without talking down to them. On the other hand, as the student begins to master the basics, the learning is presented to him in increasingly difficult problems to solve with their new skills, even while they struggle to master them. This results in increasing stress as the learning progresses, which helps the Marine to cement their skills and understanding, helping them to gain confidence as they succeed at handling more challenging problems. This in turn helps them to learn to manage higher levels of stress as they perform—all with little or no yelling or other artificial stressors. Marines in traditional Marine schools, by contrast, tend to experience decreased stress as they adjust to the environment and get more comfortable. For example, in the US Army Ranger School students later in the course require more yelling and bigger threats to induce a similar response to early days. This reduced stress results in incomplete learning, as the student often fails to “lock in” the skills in a realistic combat context. OBL aims for a much higher level of mastery of individual and team skills. The tyranny of throughput and external control means that traditional Marine Corps training (“Skills and Tasks”) results in everyone meeting minimum standards, but often prevents Marines from achieving as much as they are capable of, and often penalizes initiative and new approaches (innovation). This is certainly true in schools, but also often true in MAGTFs. The results are unfortunate but predicable. The level of individual expertise in many units is too low to enable a unit to excel in combat situations. Worse, the traditional approach can foster a climate where Marines and even Marine leaders tend to wait to be told what to do next, rather than exercising judgement and initiative. Mistakes by students or units under the OBL are treated as opportunities for learning to occur. Marines are encouraged to try things for themselves and to learn from their mistakes. The leader’s role is to make sure that the Marines analyze why something went wrong and to draw reasonable lesson from the experience (of course the teacher or leader is expected to exercise judgement and while avoiding catastrophic mistakes). Too often, Marine Corps training treats mistakes as things to be avoided or nipped in the bud. Leaders and teachers are rewarded for avoiding mistakes or correcting them immediately and are rarely encouraged to allow mistakes to unfold so that their Marines can learn from them. Accountability is built into OBL. Marines are given both the responsibility and the authority they need to conduct the learning their own way. They can be held accountable to the results they teach too, while they are focus on clear Outcomes and guided by Measures of Effectiveness (MoE). But if leaders or teachers are required a task in a certain way, as is often the case in Marine Corps training, it is difficult to blame them if their Marines don’t learn. In OBL, Marines learn accountability. Required to solve problems, and given the authority to try different solutions, Marines learn to accept responsibility for their actions and decisions. Results matter. In almost every case, Marines will come to see accountability as an enabler, allowing them to solve problems their own way. Under the OBL, Marines will be given problems to solve and then watch as they solve them. Those problems should be familiar to them, but which they could be reasonably expected to solve given their level of skills and experience. If the problems are properly designed, the teachers or leaders who are observing them will not only see clearly whether the Marines have mastered the skills but will see whether they truly understand why things are done, and will gain insight into such intangibles as initiative, judgement and accountability. An added benefit is that the assessment is good learning for the student being assessed. In a Marine Corps of motivated volunteers, expected to succeed in difficult and rapidly evolving battlefields, the new Learning Philosophy is a better way to prepare. It aligns more closely with the way people learn. While results are preliminary, the evidence is clear that it results in superior mastery of skills, better retention, higher levels of confidence, and improved judgment, initiative and accountability. On the other hand, implementing OBL poses challenges. It relies much more on Marine leader’s abilities, and so requires investment in better preparing leaders. They need to have the skills, they need to be able to explain why things are done the way they are, and they need to be able to teach. It requires the right command climate. Strict insistence on uniformity and standardization will stop it dead, since the OBL requires both leaders and Marines to experiment with different solutions. 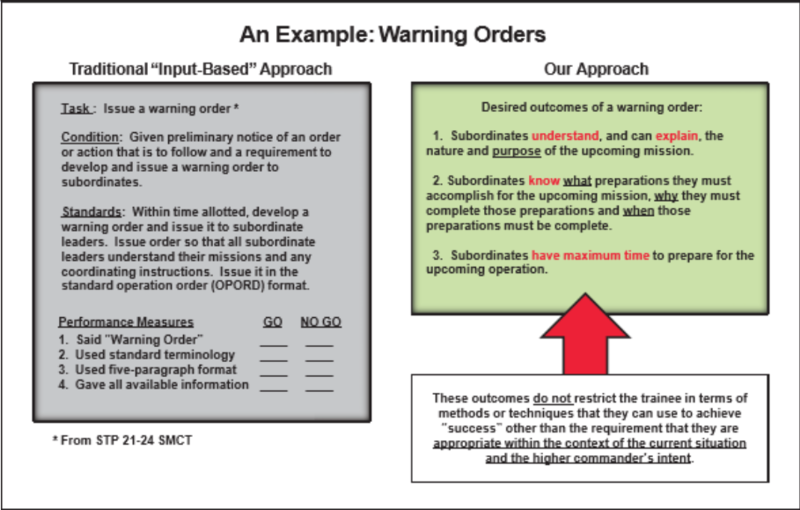 It requires commanders and teachers to create conditions that allow it, including neutralizing external agency vetoes (i.e., range control), and removing rules and processes that prevent initiative. It will require a different method of allocating resources to learning, and more flexibility in using them, since resources are currently matched to tasks being trained rather than skills attained. Nevertheless, it can be done, and then it works very well. Finally, it will require a change in Manpower’s incentives; as they all work against making the best instructors. We cannot have the passed over teaching the rapidly promoted. It makes no sense, killing the seed corn at the altar of career advancement. Finally, decision makers who adapt OBL must plan to develop cadre and leaders first, then implement in small steps. Remember, this approach cannot be done in revolutionary terms, but in evolutionary steps as leaders at all levels are developed into how to implement, nurture and teach it.